We’d love your help. Let us know what’s wrong with this preview of Goodnight to My Thoughts of You by Chelsea Rotunno. When Miriam Bernhardt, a 17-year-old high school girl from Burbank, California, falls in love with her youth leader at church, Paul Greer, she decides that it is God's will that she will someday be Paul's wife. She's ecstatic when a perfectly pure but secretive relationship quickly develops--until her mom threatens to tell the church pastor that Miriam and Paul have been s When Miriam Bernhardt, a 17-year-old high school girl from Burbank, California, falls in love with her youth leader at church, Paul Greer, she decides that it is God's will that she will someday be Paul's wife. She's ecstatic when a perfectly pure but secretive relationship quickly develops--until her mom threatens to tell the church pastor that Miriam and Paul have been secretly dating. 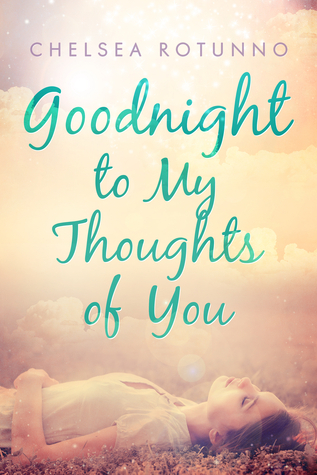 To ask other readers questions about Goodnight to My Thoughts of You, please sign up. Rotunno's writing is fresh and honest. The story arcs well with a lovable main character--full of heart and flaws. Though the heroine is a Christian, I appreciated the absence of pat answers and preachy writing. I really enjoyed this story and look forward to watching Rotunno develop as a writer. A wonderful debut! A fantastic read! After I found it on a smashwords buying spree, I quickly began to read it. It was a bit of a long read, split into two parts, each focusing on the two most important guys in Miriam's life. Length aside, I found it to be a good read. Some of the characters kind of blended in the background, and the mother, while just being a concerned mother, seemed a bit overly wicked at times, it was still put together nicely. From the very start you know that she won't be getting together wit A fantastic read! After I found it on a smashwords buying spree, I quickly began to read it. It was a bit of a long read, split into two parts, each focusing on the two most important guys in Miriam's life. Length aside, I found it to be a good read. Some of the characters kind of blended in the background, and the mother, while just being a concerned mother, seemed a bit overly wicked at times, it was still put together nicely. From the very start you know that she won't be getting together with Paul and marrying him and living happily ever after as she had thought, but it's interesting to see the coming of age journey Miriam goes through, what with her love of Paul and her later relationship with Charlie. This book was amazing! The depth and insight of dealing with relationships and life is so true. The boldness and creativity which was used during the whole story makes the reader relate deeply with the characters. Greatly recommend book to girls going through a hard emotional season... especially when it involves a guy. The best book I've read in a long time. Part 2 was the most beautiful. It was too real, I smiled & cried as I journeyed with you through the pages. You're a great writer. God bless you and your family. I'm looking forward to reading your second book. I learned so much from this book. I really, REALLY love it! Can't wait for the second book! ... and I'm not a youth leader but I'm an 18 years old girl who really appreciates this kind of books =)!